BMW 635 CSi A HIGHLINE 1989-29,000miles. 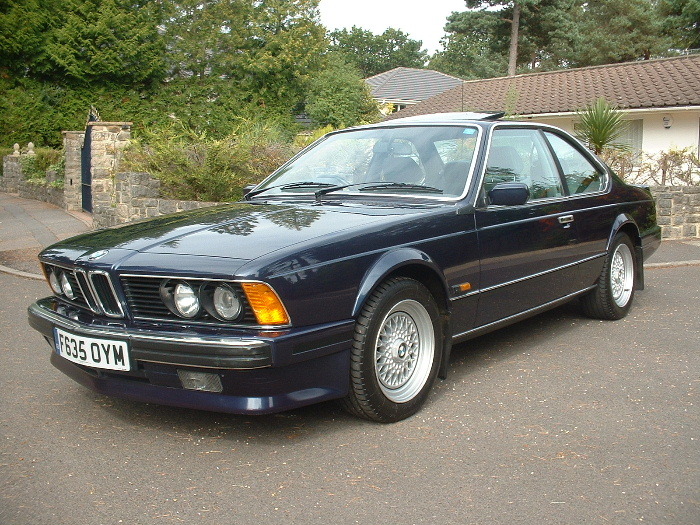 BMW 635 CSiA, 3 Doors, Automatic, Coupe, 1989 F Reg, 29,000 miles, Royal Blue Metallic, 2 Owners. ABS, Adjustable steering column/wheel, Air conditioning, Alloy wheels, Anti theft system, Central locking, Colour coding - Body, Computer, Electric mirrors, Electric windows, Electric sunroof, Foglights, Electrically adjustable seats, Head restraints, Headlight washers, Leather seats, Leather upholstery, Metallic paintwork, Power assisted steering, Radio/Cassette, Rear headrests, Spoiler, Sports seats, Sunblind, Sunroof, Tinted glass, Locking wheel nuts. An absolute showpiece !,All usual Highline extras,Full and total service history from new,1 Cabinet Minister owned + 1,Local car,Do not confuse this with cheaper 6's,this is a Mint Very low mileage car in impeccable condition throughout with '635' plate, Turnkey for Personal Pleasure or show.Please call for more details.